William de Braose was born in 1112. He was the son of Philip de Braose and Aenor of Totnes. William de Braose married Bertha of Hereford, daughter of Miles de Gloucester and Sibyl de Neufmarche, in 1150. William de Braose died in 1192. William de Braose, Third Lord of Bramber (born 1112 in Brecon) (d. ca. 1192) was the eldest son of Philip de Braose, Second Lord of Bramber. William was born into a second generation English Norman dynasty holding Lordships and land in Sussex at Bramber, also at Totnes in Devon and Radnor and Builth in the Welsh Marches of Wales. He maintained his Sussex lands and titles, extended St Mary de Haura Church in Shoreham and contributed to a priory at Sele, West Sussex. His mother was Aenor Fitz Judhel of Totnes. He also inherited one half of the honour of Barnstaple in Devon, paying a fee of 1000 marks for the privilege. William married Bertha de Pitres, also known as Bertha de Hereford, daughter of Miles of Gloucester, Earl of Hereford. Through this marriage, William acquired lordships of Brecon and Abergavenny in 1166 because Bertha's four brothers all died young without heirs. These vast land holdings greatly expanded the territorial power and income of the de Braose dynasty. They now held the Middle March with extensive interests in Sussex and Devon. William's younger brother Phillip accompanied King Henry II to Ireland, receiving in 1172 the honour of Limerick. In 1174, William became sheriff of Hereford. He died in about 1192 and was succeeded as Lord of Bramber by his son, William. He had also fathered two daughters, Maud and Sibilla, who married well and possibly a later son, named John.1 3rd Lord of Bramber. [S369] Encyclopedia website, by compilation, http://en.wikipedia.org/wiki/William_de_Braose,_3rd_Lord_of_Bramber. Name Variation Bertha of Hereford was also known as de Pitres. Married Name 1150 As of 1150,her married name was de Braose. Bertha of Hereford was born in 1130. Bertha of Hereford married William de Braose, son of Philip de Braose and Aenor of Totnes, in 1150. Bertha of Hereford, also known as Bertha de Pitres (born c.1130), was the daughter of Miles de Gloucester, 1st Earl of Hereford, and a wealthy heiress. She was the wife of William de Braose, Third Lord of Bramber to whom she brought many castles and Lordships, including Brecknock, Abergavenny, and Hay. Bertha was born in England in about 1130. She was the second daughter of Miles of Gloucester, 1st Earl of Hereford (1097- 24 December 1143) and Sibyl of Neufmarche. She had two sisters, Margaret of Gloucester, who married Humphrey II de Bohun, by whom she had issue, and Lucy of Gloucester, who married Herbert FitzHerbert of Winchester, by whom she had issue. Her five brothers, included Roger Fitzmiles, 2nd Earl of Hereford, Walter de Hereford, Henry Fitzmiles, William de Hereford, and Mahel de Hereford. Her paternal grandparents were Walter FitzRoger de Pitres, Sheriff of Gloucester and Bertha de Balun of Bateden, a descendant of Hamelin de Balun. Her maternal grandparents were Bernard de Neufmarche, Lord of Brecon, and Nesta ferch Osbern. The latter was a daughter of Osbern FitzRichard of Richard's Castle, and Nesta ferch Gruffydd. Bertha was a direct descendant, in the maternal line, of Gruffydd ap Llywelyn (1007- 5 August 1063) and Edith (Aldgyth), daughter of Elfgar, Earl of Mercia. Her father Miles served as Constable to King Stephen of England. He later served in the same capacity to Empress Matilda after he'd transferred his allegiance. In 1141, she made him Earl of Hereford in gratitude for his loyalty. On 24 December 1143, he was killed whilst on a hunting expedition. In 1150, she married William de Braose, 3rd Lord of Bramber (1112- 1192), son of Philip de Braose, 2nd Lord of Bramber and Aenor, daughter of Judael of Totnes. William and Bertha had three daughters and two sons, including William de Braose, 4th Lord of Bramber. In 1173, her brothers all having died without issue, she brought the Lordships and castles of Brecknock and Abergavenny, to her husband. Hay Castle had already passed to her from her mother, Sibyl of Neufmarche in 1165, whence it became part of the de Braose holdings. Name Variation Miles de Gloucester was also known as of Gloucester. Name Variation Miles de Gloucester was also known as Milo. Name Variation Miles de Gloucester was also known as Fitz Walter. Name Variation Miles de Gloucester was also known as of Hereford. Miles de Gloucester was born in 1100. He was the son of Walter de Gloucester and Bertha de Balun. Miles de Gloucester married Sibyl de Neufmarche, daughter of Bernard de Neufmarche and Agnes ferch Osbern, in 1121. Miles de Gloucester died on 24 December 1143. Earl of Hereford. Miles de Gloucester, 1st Earl of Hereford, Lord of Brecknock (1100–24 December 1143), was the son of Walter de Gloucester, who appears as sheriff of that county between 1104 and 1121. Milo or Miles succeeded his father about the latter year. He was high in the service of Henry I between 1130 and 1135, he was Constable of England and combined the hereditary office of Sheriff of Gloucester with that of local justiciar for Gloucestershire. After the death of King Henry he declared for Stephen, at whose court he appears as constable in 1136. King Stephen granted him the honour of Gloucester and Brecknock. However, in 1139, when the empress Matilda appeared in England, he declared for her, and placed the city of Gloucester at her disposal; he was further distinguished by sacking the nearby royalist city of Worcester, attacking Stephen's siege works at Wallingford Castle and reducing the county of Hereford. He was retained as her Constable. In 1141, he was rewarded with the earldom of Hereford when Matilda ruled the country. He remained loyal to the Empress after her defeat at Winchester the same year. John of Salisbury classes him with Geoffrey de Mandeville and others who were non tam comites regni quam hostes publici. The charge is justified by his public policy; but the materials for appraising his personal character do not exist. Married Name Her married name was Fitz Walter. Married Name 1121 As of 1121,her married name was de Gloucester. Sibyl de Neufmarche was the daughter of Bernard de Neufmarche and Agnes ferch Osbern. Sibyl de Neufmarche married Miles de Gloucester, son of Walter de Gloucester and Bertha de Balun, in 1121. Bernard de Neufmarche married Agnes ferch Osbern, daughter of Osbern FitzRichard and Princess Nesta verch Gruffydd. Bernard de Neufmarche was born circa 1050. He was the son of Geoffrey de Neufmarche and Ada de Hugleville. Bernard de Neufmarche died circa 1125. Bernard of Neufmarché or Newmarket (c. 1050 – c. 1125) was "the first of the original conquerors of Wales." He was a minor Norman lord who rose to power in the Welsh Marches before successfully undertaking the invasion and conquest of the Kingdom of Brycheiniog between 1088 and 1095. Out of the ruins of the Welsh kingdom he created the Anglo-Norman lordship of Brecon. Married Name Her married name was ap Rhys II. Name Variation Matilda de Braose was also known as Maud. Matilda de Braose was the daughter of William de Braose and Matilda de St. Valery. Matilda de Braose married Prince Gruffydd ap Rhys II, son of Rhys ap Gruffydd and Gwenllian ferch Madog. Name Variation Prince Gruffydd ap Rhys II was also known as of Deheubarth. Prince Gruffydd ap Rhys II was the son of Rhys ap Gruffydd and Gwenllian ferch Madog. Prince Gruffydd ap Rhys II married Matilda de Braose, daughter of William de Braose and Matilda de St. Valery. Prince Gruffydd ap Rhys II died in 1201. Margaret de Braose was the daughter of William de Braose and Matilda de St. Valery. Margaret de Braose married Walter de Lacy. Walter de Lacy married Margaret de Braose, daughter of William de Braose and Matilda de St. Valery. Walter de Lacy was born before 1170. He died on 24 February 1240. Name Variation Sibilla de Braose was also known as Sibylla. Sibilla de Braose was the daughter of William de Braose and Bertha of Hereford. Sibilla de Braose married William de Ferrers, son of Robert II de Ferrers and Margaret Peverel. Married Name Her married name was de Brompton. Maud de Braose was the daughter of William de Braose and Bertha of Hereford. Philip de Braose married Aenor of Totnes, daughter of Judael of Totnes. Philip de Braose was born circa 1070. He was the son of William de Braose and Agnes de St. Clare. Philip de Braose died between 1131 and 1139. 2nd Lord of Bramber. Philip de Braose, 2nd Lord of Bramber was a Norman nobleman whose father, William de Braose (d.1093–1096) had participated in the victory over the English Saxons at the Battle of Hastings in support of William the Conqueror. William de Braose, 1st Lord of Bramber had been rewarded with a Barony and lands in Sussex and the Welsh Marches of Wales. Philip was born about 1070 to 1073 in Bramber, his mother being Agnes de St. Clare (born 1048 to 1054) (died 1080) of Barnstaple in Devon. Philip's task as heir was to consolidate these lands and expand them wherever possible. In 1096 he confirmed his father's gifts to the Abbey of St. Florent. Through marriage to Aenor, daughter of Juhel of Totnes or Totenais (born 1084) he also acquired land in Totnes, Devon and held this valuable Lordship also. It was Philip de Braose who conquered the Welsh borderlands at Builth and New Radnor and established new Norman Lordships over them as a Marcher Lord. He seems to have gone on the First Crusade in 1103. He was responsible for the building of St. Nicolas' Church, Old Shoreham in Sussex and founded the port at New Shoreham. He supported King Henry I of England against Robert Curthose and then in 1110 revolted against King Henry I of England who confiscated his estates as a result. Name Variation Aenor of Totnes was also known as Fitz Judhel. Aenor of Totnes married Philip de Braose, son of William de Braose and Agnes de St. Clare. Aenor of Totnes was born in 1084. She was the daughter of Judael of Totnes. Juhel of Totnes was a Breton nobleman and supporter of William I of England of the eleventh century. replaced the Breton Judhel, whom he expelled from Totnes at the beginning of his reign for an unknown reason, with his favourite, Roger (I) of Nonant. 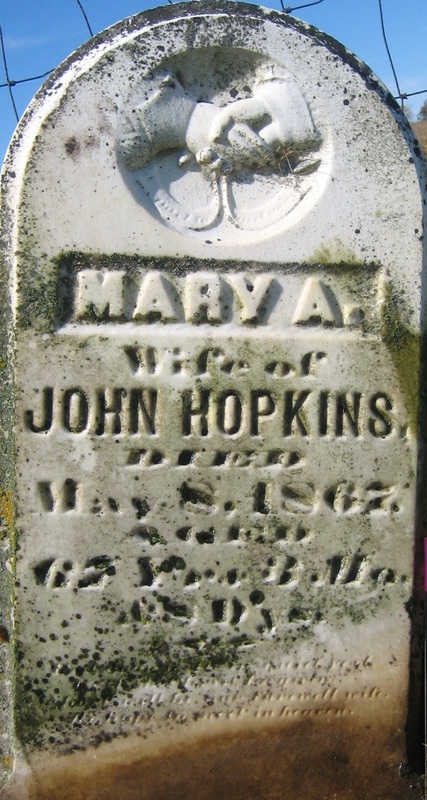 Married Name before 1827 As of before 1827,her married name was Hopkins. Mary A. Mullen was born in 1800 at Pennsylvania also reported as 1805. She married John Hopkins, son of Humphrey Hopkins and Sarah (? ), before 1827. Mary A. Mullen died on 8 May 1867. She was buried after 8 May 1867 at Smelser Cemetery, Georgetown, Grant, Wisconsin. [S249] U.S. Federal Census 1850 U.S. Federal Census, by Ancestry.com, Year: 1850; Census Place: Eastern District, Grant, Wisconsin; Roll M432_998; Page: 126B; Image: 167. [S248] U.S. Federal Census 1860 U.S. Federal Census, by Ancestry.com, Year: 1860; Census Place: Smelser, Grant, Wisconsin; Roll M653_1409; Page: 688; Image: 708; Family History Library Film: 805409. Name Variation Frederick Hopkins was also known as Fred. Frederick Hopkins was born circa 1827 at Pennsylvania. He was the son of John Hopkins and Mary A. Mullen. Sarah J. B. Hopkins was born circa 1843 at Wisconsin. She was the daughter of John Hopkins and Mary A. Mullen. Leonard Hoadley married Astor (?). Leonard Hoadley was born circa 1796. Married Name Her married name was Hoadley. Astor (?) married Leonard Hoadley. Astor (?) was born circa 1800. Name Variation Francis M. Warner was also known as F. M.
Francis M. Warner was born on 12 March 1826 at Kentucky also reported as Mar 1827. 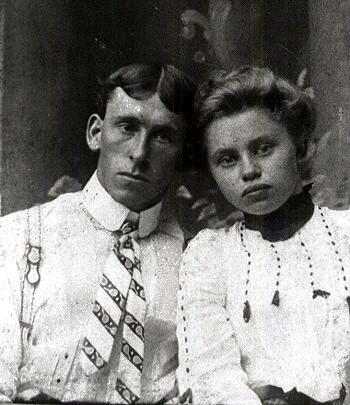 He married Martha Buckley, daughter of William J. Buckley and Lucretia Proctor, on 27 June 1895 at Morgan, Missouri. Francis M. Warner married Catherine B. (?) in 1900 at both previously married married between Jan-June 1900. Francis M. Warner died on 31 January 1911 at Osage, Morgan, Missouri, at age 84. He was buried on 1 February 1911 at Silvey Cemetery, Laurie, Morgan, Missouri. [S244] U.S. Federal Census 1910 U.S. Federal Census, by Ancestry.com, Year: 1910; Census Place: Osage, Morgan, Missouri; Roll: T624_801; Page: 8A; Enumeration District: 0115; Image: 917; FHL Number: 1374814. 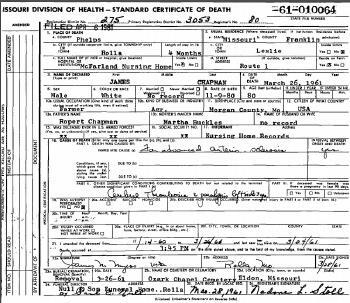 Name Variation Emma Chapman was also known as Roemma. Name Variation Emma Chapman was also known as Roemmy. 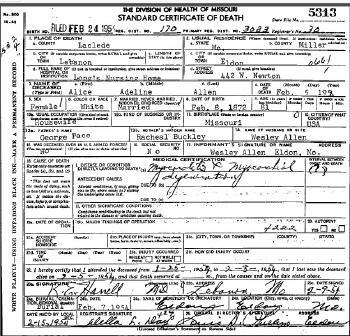 Married Name 25 December 1892 As of 25 December 1892,her married name was Kays. Married Name 5 May 1917 As of 5 May 1917,her married name was Guyll. Married Name 5 May 1917 As of 5 May 1917,her married name was Guill. Emma Chapman was born in 1877 at Missouri. She was the daughter of Robert C. Chapman and Martha Buckley. Emma Chapman and John Oliver Kays were divorced before 1910. 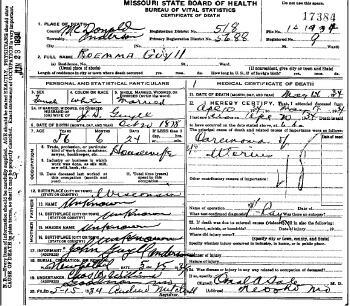 Emma Chapman married John S. Guyll on 5 May 1917 at Carthage, Jasper, Missouri. 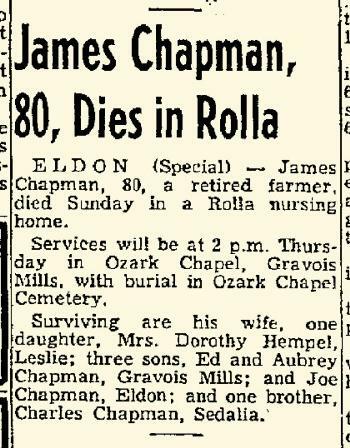 Emma Chapman was buried in 1934 at McDonald, Missouri. Emma Chapman had zero children. 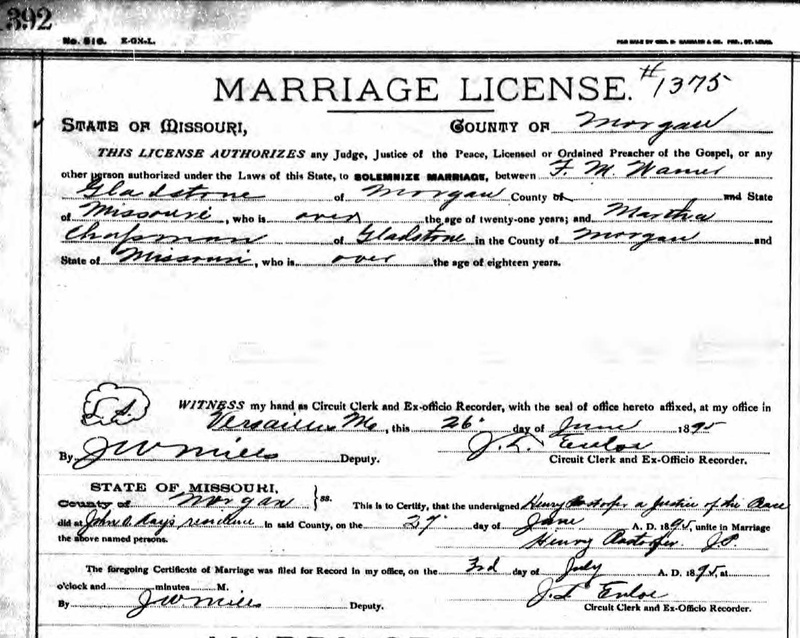 [S370] Missouri Marriage Records, 1805-2002 (published). [S246] U.S. Federal Census 1880 U.S. Federal Census, by Ancestry.com, NA Film Number T9-0617 Page Number 468A. [S245] U.S. Federal Census 1900 U.S. Federal Census, by Ancestry.com, Year: 1900; Census Place: Osage, Morgan, Missouri; Roll T623_ 877; Page: 10B; Enumeration District: 78. [S244] U.S. Federal Census 1910 U.S. Federal Census, by Ancestry.com, Year: 1910; Census Place: Osage, Morgan, Missouri; Roll T624_801; Page: 8A; Enumeration District: 115; Image: 913. [S243] U.S. Federal Census 1920 U.S. Federal Census, by Ancestry.com, Year: 1920; Census Place: Commerce, Ottawa, Oklahoma; Roll: T625_1481; Page: 15A; Enumeration District: 132; Image: 838. [S250] U.S. Federal Census 1930 U.S. Federal Census, by Ancestry.com, Year: 1930; Census Place: Anderson, McDonald, Missouri; Roll: 1210; Page: 3B; Enumeration District: 0002; Image: 636.0; FHL microfilm: 2340945. 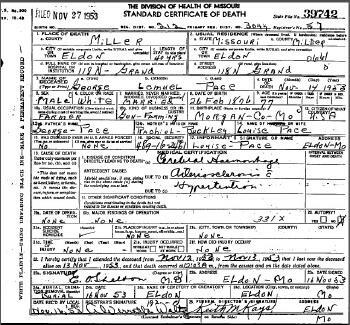 Married Name 1 November 1889 As of 1 November 1889,her married name was Moore. Married Name 9 March 1910 As of 9 March 1910,her married name was Kendricks. Married Name 9 March 1910 As of 9 March 1910,her married name was Kendrick. Married Name after 1940 As of after 1940,her married name was McDonald. 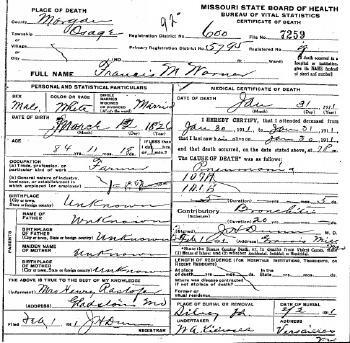 Mary Lou Chapman was born on 25 December 1872 at Morgan, Missouri. Mary Lou Chapman married John R. Moore, son of (?) Moore and unknown (? ), on 1 November 1889. Mary Lou Chapman and John R. Moore were divorced before 1910. Mary Lou Chapman married Benjamin Franklin Kendrick on 9 March 1910 at 2nd marriage for both, Versailles, Morgan, Missouri. 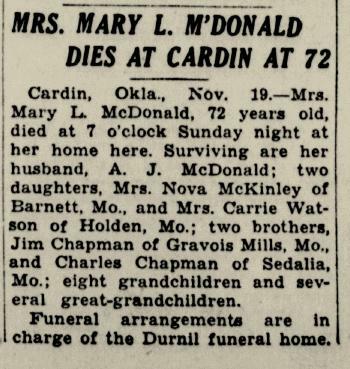 Mary Lou Chapman married A. J. McDonald after 1940. Mary Lou Chapman died in November 1945 at Cardin, Oklahoma, at age 72 Mary Lou (Chapman) Moore Kendrick McDonald obituary. She was buried on 21 November 1945 at Grand Army of the Republic Cemetery, Miami, Ottawa, Oklahoma. Mary Lou Chapman had 4 with 4 living in 1900 children. She had 4 with 3 living in 1910 children. [S245] U.S. Federal Census 1900 U.S. Federal Census, by Ancestry.com, Year: 1900; Census Place: Osage, Camden, Missouri; Roll T623_845; Page: 12A; Enumeration District: 9. [S244] U.S. Federal Census 1910 U.S. Federal Census, by Ancestry.com, Year: 1910; Census Place: Osage, Morgan, Missouri; Roll: T624_801; Page: 8B; Enumeration District: 0115; FHL microfilm: 1374814. [S243] U.S. Federal Census 1920 U.S. Federal Census, by Ancestry.com, Year: 1920; Census Place: Commerce, Ottawa, Oklahoma; Roll: T625_1481; Page: 14A; Enumeration District: 132; Image: 836. [S250] U.S. Federal Census 1930 U.S. Federal Census, by Ancestry.com, Year: 1930; Census Place: Cardin, Ottawa, Oklahoma; Roll: 1923; Page: 1A; Enumeration District: 0004; Image: 602.0; FHL microfilm: 2341657. [S373] U.S. Federal Census 1940 U.S. Federal Census, by Ancestry.com, Year: 1940; Census Place: Quapaw, Ottawa, Oklahoma; Roll: T627_3321; Page: 61B; Enumeration District: 58-32. Name Variation Thomas William Chapman was also known as William Thomas. Name Variation Thomas William Chapman was also known as Willie. 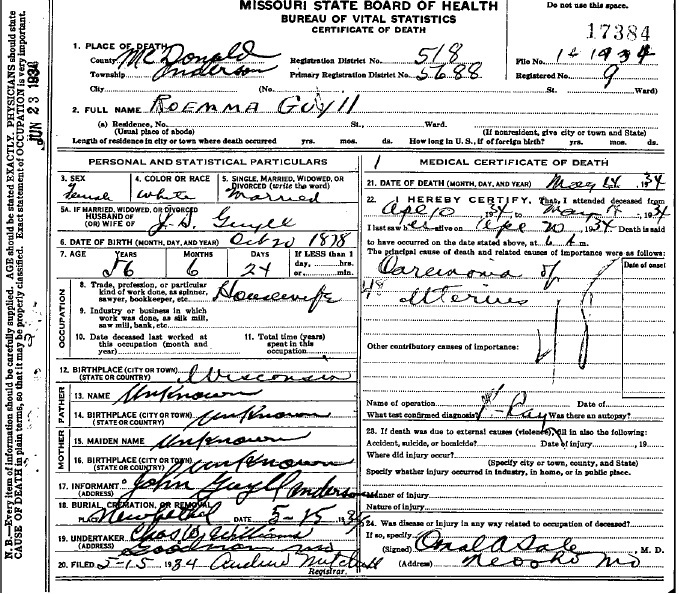 Thomas William Chapman was born on 23 March 1871 at Gravois Mills, Morgan, Missouri, also reported as circa 1874; also reported as 23 Mar 1869. He was the son of Robert C. Chapman and Martha Buckley. Thomas William Chapman married Jennie Gaston, daughter of (?) Gaston and Ellen (? ), circa 1900. Thomas William Chapman died on 29 January 1943 at Sedalia, Pettis, Missouri, at age 71 Thomas William Chapman was born March 23, 1869 in Morgan County, Mo. and passed away Friday night at his home, aged 74 years. He is survived by his widow and the following children: Bryan of Okla., Raymond, Sedalia, Eugene, Kas., Mrs. Lena Ward, Plattsburg, Lester, Calif., Mrs. Dorothy Greer, Glenn, Thomas and Miss Beulah Chapman of Sedalia. He was buried on 1 February 1943 at Crown Hill Cemetery, Sedalia, Pettis, Missouri. [S243] U.S. Federal Census 1920 U.S. Federal Census, by Ancestry.com, Year: 1920; Census Place: Quapaw, Ottawa, Oklahoma; Roll: T625_1481; Page: 18B; Enumeration District: 125. Name Variation Henry Allen Chapman was also known as Hank. Henry Allen Chapman was born circa 1879 at Wisconsin. Henry Allen Chapman married Florence Ethel Thompson, daughter of William Jefferson Thompson and Thomas Anna Biggs, on 6 April 1931. Henry Allen Chapman and Florence Ethel Thompson were divorced before 1940. Henry Allen Chapman died in 1940. Name Variation James Edward Chapman was also known as Jim. James Edward Chapman was born on 9 November 1880 at Wisconsin. James Edward Chapman and Mollie May Tryon were divorced before 1930. James Edward Chapman died on 26 March 1961 at age 80 James Edward Chapman obituary. He was buried after 26 March 1961 at Ozark Chapel Cemetery, Laurie, Morgan, Missouri. Never remarried after the divorce. [S245] U.S. Federal Census 1900 U.S. Federal Census, by Ancestry.com, Year: 1900; Census Place: Russell, Camden, Missouri; Roll T623_845; Page: 14A; Enumeration District: 10. Name Variation Charles Albert Chapman was also known as Charley. Charles Albert Chapman was born on 31 May 1883 at Iowa. He was the son of Thomas Albert Chapman and Martha Buckley. Charles Albert Chapman married Lily May Turpin, daughter of John T. Turpin and Rena Moore, circa 1903. 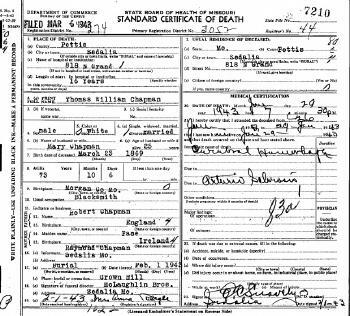 Charles Albert Chapman died on 20 December 1972 at Sedalia, Pettis, Missouri, at age 89. He was buried after 20 December 1972 at Versailles Cemetery, Versailles, Morgan, Missouri. [S243] U.S. Federal Census 1920 U.S. Federal Census, by Ancestry.com, Year: 1920;Census Place: Washington, Osage, Missouri; Roll T625_938; Page: 3A; Enumeration District: 145; Image: 1180. Name Variation Alice Adeline Pace was also known as Adeline. Name Variation Alice Adeline Pace was also known as Alice Addie. Married Name 15 April 1888 As of 15 April 1888,her married name was Allen. Alice Adeline Pace was born on 8 February 1872 at Missouri. She was the daughter of George William Pace Jr. and Rachel M. Buckley. 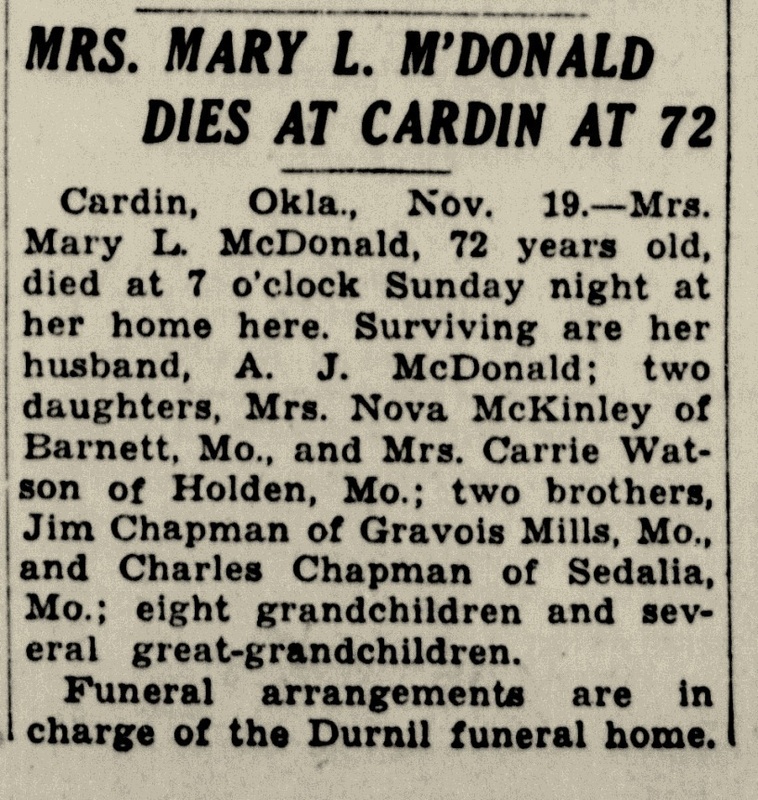 She was buried after 5 February 1954 at Eldon Cemetery, Eldon, Miller, Missouri. [S246] U.S. Federal Census 1880 U.S. Federal Census, by Ancestry.com, Year: 1880; Census Place: Osage, Morgan, Missouri; Roll T9_705; Family History Film: 1254705; Page: 253.3000; Enumeration District: 196; Image: 0509. [S243] U.S. Federal Census 1920 U.S. Federal Census, by Ancestry.com, Year: 1920;Census Place: Osage, Morgan, Missouri; Roll T625_935; Page: 5A; Enumeration District: 130; Image: 1120. Sarah Pace was born circa 1874 at Missouri. Name Variation George Lemuel Pace was also known as Lem. Name Variation George Lemuel Pace was also known as Lemuel. George Lemuel Pace was born on 26 February 1876 at Morgan, Missouri, also reported as 26 Feb 1874. He was the son of George William Pace Jr. and Rachel M. Buckley. George Lemuel Pace married Louise J. Finley, daughter of Christopher Finley and Josephene Moore, on 18 March 1900. [S245] U.S. Federal Census 1900 U.S. Federal Census, by Ancestry.com, Year: 1900; Census Place: Osage, Morgan, Missouri; Roll T623_877; Page: 1B; Enumeration District: 78. Joseph William Pace was born on 13 August 1878 at Missouri. 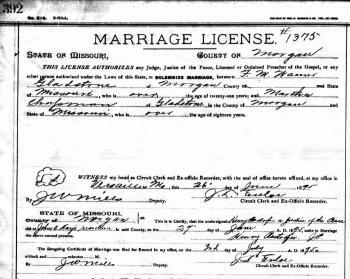 Joseph William Pace married Rotha Houser on 14 March 1897. Joseph William Pace died on 28 September 1972 at Missouri at age 94.